Though M. Night Shyamalan’s latest film, the found footage horror flick The Visit has divided viewers—some decry it as total garbage, while others have praised it as at least a partial return to form—he must have enjoyed partnering with low-budget genre masters Blumhouse Productions, as the two are currently working on another film. That project, however, just suffered a sizeable setback, as Joaquin Phoenix has left the film, but don’t worry, they’ve lined up a solid replacement. According to The Hollywood Reporter, X-Men star James McAvoy has stepped up to fill the void left by Phoenix’s departure. He is currently in negotiations to take the part vacated by the Inherent Vice star in a movie that is being called a "supernatural thriller. Aside from that, and the fact that it involves Jason Blum as a producer, there’s not much else known about the project at the present time. Even though Shyamalan takes a great deal of heat for his films, he has consistently been able to populate them with big name talent. The notable exceptions to this are The Visit and Avatar: The Last Airbender. This was going to be Phoenix’s third go round with the Sixth Sense director, having previously appeared in both Signs and The Village. While James McAvoy may not be a star the stature of the likes of Will Smith or Mark Wahlberg, or as critically lauded as Phoenix, he’s certainly no slouch. He’s appeared in everything from big time studio tentpoles, like the X-Men movies, to small indie drama’s like The Disappearance of Eleanor Rigby, and been very good in all of them. No reason for Phoenix’s departure has been given, but though he was presumed to be the star, sources tell THR that there was in fact no concrete deal in place, so it’s possible talks simply broke down or he moved on for other reasons. Given Blumhouse’s track record, Shyamalan’s new movie isn’t likely to have a huge budget, so it’s possible money was an issue, and if McAvoy does sign on the dotted line, he could be a big get for what will likely be a modest production. While it wasn’t exactly a juggernaut like some of Shyamalan’s earlier films, The Visit has earned a total of $67 million worldwide. And that may not sound like much when compared to the opening of the latest superhero joint, with a budget of $5 million, that’s a decent profit margin. We’ll have to wait for a while to see what M. Night Shyamalan has in the works for his next movie. In the meantime, however, we’ll have plenty of opportunities to see James McAvoy on the big screen. 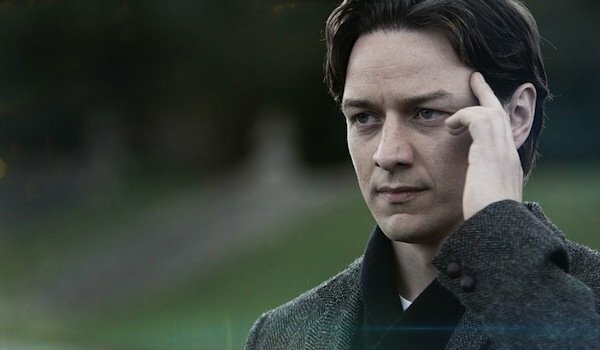 He co-stars with Daniel Radcliffe in Victor Frankenstein, which opens later this year, and he once again takes on the role of professor Charles Xavier (with a shaved head this time) in X-Men: Apocalypse next year.